A parliamentary report of 1777 recorded parish workhouses in operation at Kingsbridge (for up to 20 inmates), East Allington (20), West Alvington (30), Aveton Gifford (40), Bigbury (20), Blackawton (34), Loddiswell (25), Malborough (28), Ringmore (20), and Thurlestone (20). 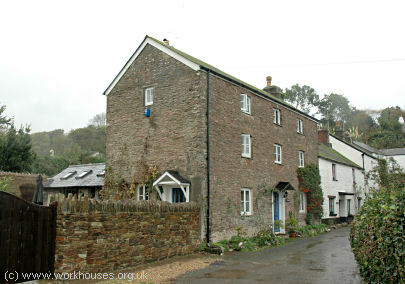 A house dating from 1822 on Brook Street in Slapton was used as the parish's workhouse. 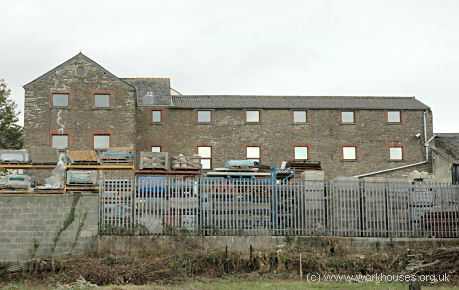 Slapton's former workhouse on Brook Street, 2005. 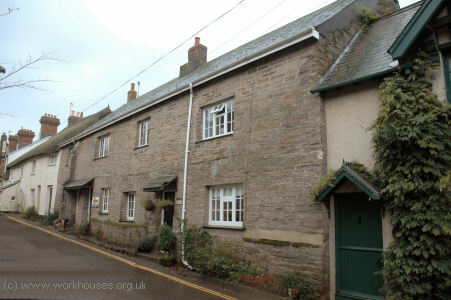 In Thurlestone, a poorhouse once operated in a row of cottages at 1-3 Church Street. Church Street cottages in Thurlestone, 2005. In South Milton, Shute Cottages are believed to have once housed the parish poorhouse. The building, which dates back to the 16th century, is very characteristic of the area. Shute cottages in South Milton, 2005. Devon: East Allington, West Alvington (2), Aveton Gifford (2), Bigbury, Blackawton (3), Buckland Toutsaints, Chivelstone, Charleston, Churchstow, Dodbrooke (2), South Huish, Kingsbridge (5), Loddiswell (2), Malborough (3), South Milton, Modbury (3), South Pool, East Portlemouth, Ringmore, Slapton, Stokenham (3), Sherford, Stoke Fleming (2), Thurleston [Thurlestone], Woodleigh. The population falling within the Union at the 1831 census had been 20,164 with its parishes ranging in size from from Buckland Toutsaints (population 46) to Modbury (2,116) and Kingsbridge itself (1,586). The average annual poor-rate expenditure for the period 1834-36 had been £9,069 or 9s.0d. per head of the population. 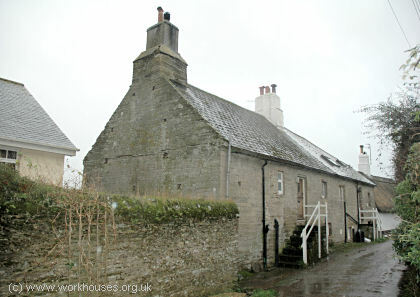 The Kingsbridge Union workhouse was built in 1837 at the west of Kingsbridge. It was designed by Thomas Ponsford who was also the architect of the Totnes Union workhouse. In 1837, the Poor Law Commissioners authorised the sum of £5,673 on construction of the building which was intended to accommodate 350 inmates. The Kingsbridge design was based on the popular square design by Sampson Kempthorne published by the Commissioners in 1835. The workhouse location and layout are shown on the 1906 map below. Kingsbridge entrance from the south-east. A two-storey entrance block at the south would probably have contained the Guardians' board-room and porters's lodge. Kingsbridge entrance block from the south-east, 2005. The three-storey main accommodation block at the centre of the site, and service buildings to the north, possibly including a small infirmary. Kingsbridge west end of main building from the south, 2005. Kingsbridge east end of main building from the south, 2005. 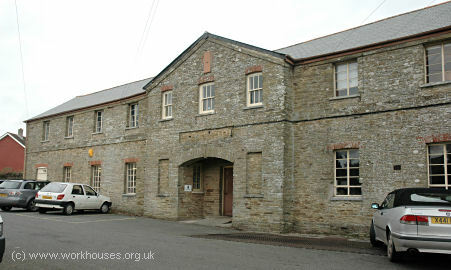 The workhouse was situated directly to the west of the Kingsbridge Town Hall. Local legend has it that the Town Hall clock deliberately had no face showing towards the workhouse so that the inmates could never be "clock-watching". 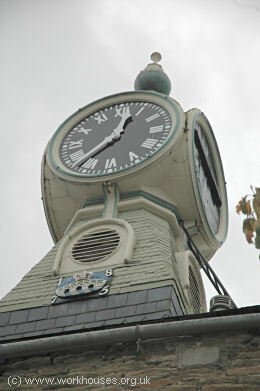 Kingsbridge Town Hall clock from the north-west, 2005. A tragic occurrence in the Kingsbridge Workhouse, just after I had taken charge of the District, at the end of 1896, had the effect of directing public attention to the last-named question. An old man called Rawle, detained under a certificate that "it was not necessary for the convenience of the lunatic or of the other inmates that he should be kept separate" (this being one of the alternative forms under the Lunacy Act), had been placed in the old men's dormitory, and for about a fortnight gave no trouble. Afterwards, his mania led him to wander about the room at night, sometimes trying to get into the beds of other men, or to pull the clothes off. They made no complaint to the Master, but on going his rounds one morning he discovered Rawle in bed bleeding and unconscious. The Medical Officer was sent for, and found that while the unfortunate man's body bore marks of his having been severely beaten, there were several wounds on his head, one apparently inflicted by a hobnailed boot, and the result was that he died a fortnight afterwards. A coroner's inquest was held, and the jury returned an open verdict, attaching to it however one of those idiotic riders which seem inseparable from "'quest law," and which solemnly warned the Guardians against the dangers of bedsteads with corners to them, as if any bedsteads were ever made without corners, and as if these particular corners had in some quite unintelligible fashion been concerned in the catastrophe. The police took before the magistrates three inmates of the ward who owned that they had struck Rawle. Two of these were committed to the Assizes, but there was practically no evidence against them except their own admissions, and nothing precisely to show the origin of the particular injuries which caused death. They were accordingly acquitted. Probably three or four men had combined with the intention of giving Rawle such a beating as would deter him from annoying his room-fellows in the way already described; and although this beating was administered with shocking brutality, the blows on the head were very likely inflicted by accident in the darkness. No alarm was given, because nearly all the persons not concerned in the affray were so infirm that they could scarcely be expected, especially in the dark, to make their way to the bell by which the Master might have been summoned. After making full investigation I came to the conclusion that the fact that Rawle's special mania had not been made known either to the Master or the Medical Officer precluded me from attaching blame to them, but it was obvious that more effective supervision was required, and I persuaded the Guardians to separate the imbeciles and appoint an officer to supervise them. After 1930, the workhouse was redesignated as a Public Assistance Institution under the control of the Devonshire County Council, becoming known as Homelands. In January 1959, a fire caused severe damage to the central part of the buildings, by then used as a furniture store, agricultural engineering workshops, and flour and corn store. 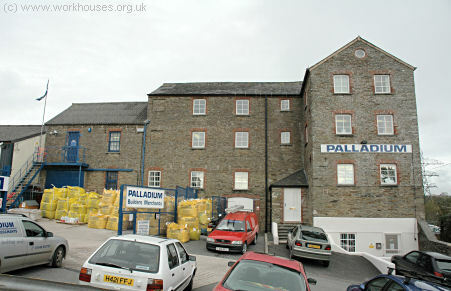 The surviving buildings are now used as various small business premises.